› Author AffiliationsThis work was supported by the Hans Knöll Institute, the Leibniz ­Association, the Daimler und Benz foundation (Scholarship to P.S. ), and the Jena School of Microbial Communication and Aventis foundation (Scholarships to M.K. ), DFG STA 1431/2-1 and SFB 1127 ChemBioSys. Bacterially produced natural products, i.e., low molecular weight metabolites, or derivatives thereof, constitute most of the commercially available antibiotics as well as a large proportion of anticancer drugs. While indispensable as therapeutically active compounds, the ecological roles of many of these bacterial natural products remain poorly understood. 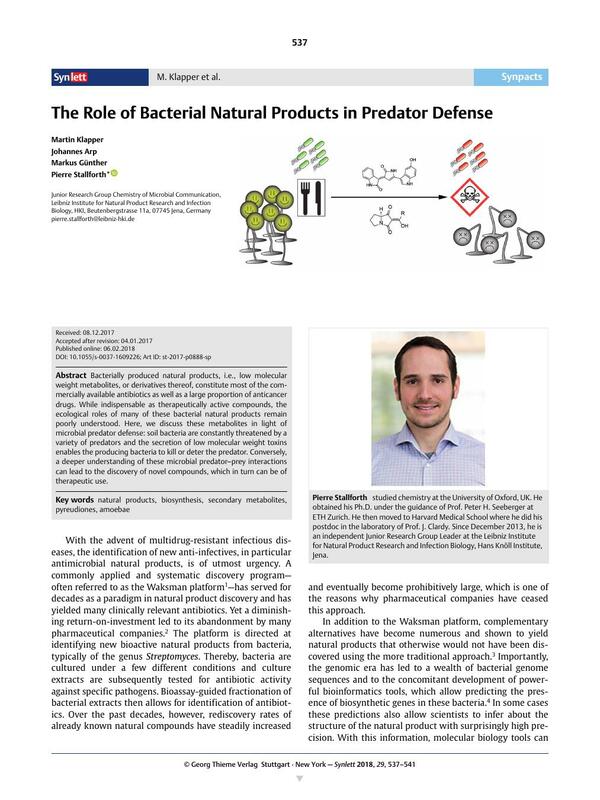 Here, we discuss these metabolites in light of ­microbial predator defense: soil bacteria are constantly threatened by a variety of predators and the secretion of low molecular weight toxins enables the producing bacteria to kill or deter the predator. Conversely, a deeper understanding of these microbial predator–prey interactions can lead to the discovery of novel compounds, which in turn can be of therapeutic use.